The miraculous turnaround season for the Boston Red Sox ended with an emphatic exclamation point Wednesday night as Boston downed the St. Louis Cardinals 6-1 to take the 2013 World Series four games to two. It’s the eighth championship title for the Sox since they won the inaugural World Series in 1903 and the franchise's third title in the last decade. 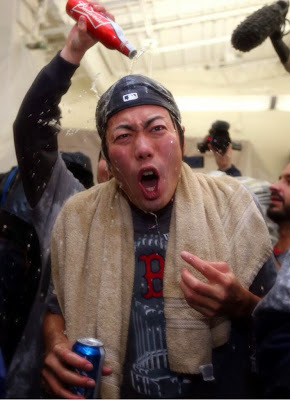 After finishing a woeful 69-93 in 2012, the Red Sox tied the Cardinals for the MLB's best record at 97-55 this year, won the American League East crown, beat the Tampa Bay Rays 3-1 in the Division Series and defeated the Detroit Tigers 4-2 in the ALCS. It marked the first time the Red Sox have clinched a World Series at Fenway Park in 95 years. The last time Boston won baseball's biggest prize on their home field was Sept. 11, 1918, when the Sox defeated the Chicago Cubs 2-1 in Game Six to win a fifth championship title. The Red Sox are only the second team to win a World Series one season after finishing last in its division. The Minnesota Twins were the first, in 1991. David Ortiz, the last man standing from the 2004 championship squad, won his third ring with the Sox and was fittingly crowned the World Series MVP after hitting .688 with two homers, two doubles and six RBI over six games. He becomes the first non-Yankee to earn three world championship rings with the same team since Jim Palmer accomplished the feat as a member of the Orioles in 1966, ’70 and ’83. Jacoby Ellsbury, Dustin Pedroia and Jon Lester — who were all part of Boston's 2007 championship over Colorado — each earn their second World Series Rings with Boston. Shane Victorino was the hero of the night, going 2 for 3 with four RBI and a walk as the Red Sox tagged St. Louis starter Michael Wacha early and often, shackling the rookie phenom with six runs on five hits over three and two thirds. Stephen Drew woke up from his slump to go 2 for 4 with a solo homer, while Mike Napoli drove home the other run for the Sox. Three nights after pitching a scoreless inning of relief in Game Four, Sox starter John Lackey was in vintage form once again, working six and two thirds and allowing only one run on nine hits while striking out five and walking one to get the win and become the first pitcher ever to start and win the clinching game of the World Series for two different teams (Anaheim, 2002). Junichi Tazawa, Brandon Workman and Koji Uehara combined to hold the Cardinals off the score sheet the rest of the way. 1) Three Little Beards: Shane Victorino ripped a double to left in the third to score Jacoby Ellsbury, David Ortiz and Jonny Gomes and give Boston a 3-0 lead. 2) He Was Drew For A Hit: Coming into the game with a .067 average and seven strikeouts, Stephen Drew finally connected in the fourth inning, driving the first pitch he saw from Michael Wacha to right center to lift the Sox to a 4-0 lead. 3) Siesta Fiesta: Still in the fourth and after intentionally walking David Ortiz to put men on the corners with two out, Mike Napoli slapped a 1-1 fastball into left to bring home Ortiz and put the Sox up 5-0. 4) Tazmanian Bedviled: After Carlos Beltran drove in the first St. Louis run of the game in the seventh and the Cardinals had the bases loaded with two out, Junichi Tazawa came out of the bullpen to relieve John Lackey and quickly got Allen Craig to ground out to first to end the threat and the inning. That’s all she wrote, folks. World Series Champions parade through Boston and down the banks of the River Charles this Saturday.